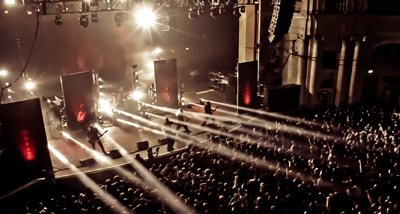 Fans can catch their first glimpse of footage from Swedish extreme metal deviants MESHUGGAH’s upcoming live DVD / Blu-Ray + 2-CD release, The Ophidian Trek, due out in North America on September 30th. Watch The Ophidian Trek teaser below. Footage was shot in the U.S. & Europe during The Ophidian Trek tour and includes festival footage from Wacken Open Air 2013 in Germany. The live audio was processed & edited by MESHUGGAH guitarist Fredrik Thordendal, mixed by Daniel Begstrand (MESHUGGAH, DIMMU BORGIR, BEHEMOTH), and mastered by Mats “Limpan” Lindfors (ROXETTE, OPETH, MANDO DIAO). Pre-order bundles – which include an exclusive album art t-shirt + a replica tour pass – are now available from the Nuclear Blast USA Webshop. Additional “25 Years of Deviance” exclusive artwork t-shirts are also available. "The Hurt That Finds You First"
"Dancers To A Discordant System"
"Mind's Mirrors / In Death - Is Life / In Death - Is Death"
The Ophidian Trek is MESHUGGAH’s second live DVD, the first being 2010’s Alive, which debuted at #8 on the U.S. Nielsen SoundScan Top Music DVD Video chart. 2012’s Koloss, the band’s eighth studio album, debuted at #17 on the Billboard Top 200 Albums chart, #24 on the Canadian Top 200 chart, #31 in the World Sales chart, and #48 on the German Media Control chart. Get caught in the undertow at www.MESHUGGAH.net.